The allocation for housing at Blackwell Farm has been reduced by 300 to 1,500. This “due to phasing of delivery expected beyond 2034”, which I take to mean that the additional housing will be built after 2034. There is no reduction in the land area taken out of green belt. The site will now include a high school as well as a primary school. The access road from the A31 appears to be a widening of the existing single-lane, tree-tunnelled track to Down Place. A through vehicular link to Egerton road will be “controlled” to provide a new route for employees and emergency services to the Surrey Research Park, the University of Surrey’s Manor Park campus and the Royal Surrey County Hospital, as well as the new residents of Blackwell Farm estate. 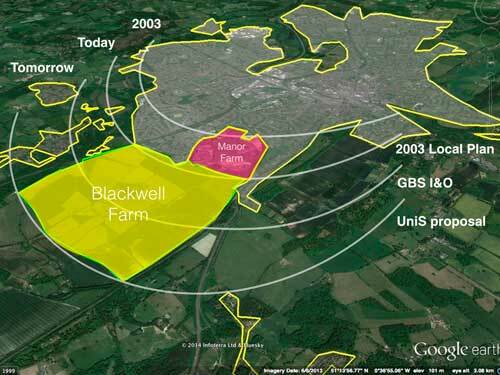 The Surrey research will be extended onto Blackwell Farm and no longer be categorised as B1 a/b, but will comprise “an Office and Research & Development Strategic Employment Site”. A new rail station at Guildford West, Park Barn is now included as a site allocation. The proposed development site at Normandy site has been removed from the Local Plan. The allocation for housing at Gosden Hill has been reduced by 300 to 1,700. The allocation for housing at Wisley remains at 2,000. Blackwell Farm is the field which the artist is painting, and it is worth watching to the end for the “punchline”. The CPRE Surrey Branch newsletter also features Blackwell Farm (see attached). 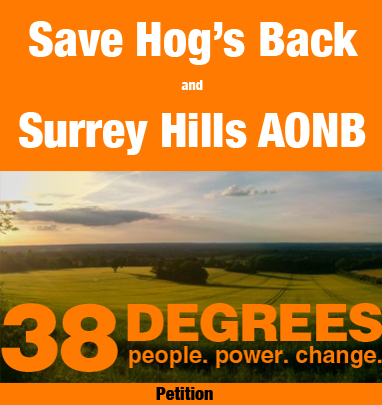 The London Green Belt Council the London Green Belt Council has chosen to support the Save Hogs Back campaign. A planning application has been submitted to build accommodation for 550 University of Surrey students on the Guildford College campus (17/P/00509). Whilst Guildford needs more student accommodation to built, because it is denser and relieves housing need in the town centre, the University appears to be avoiding building this on its own campus at Manor Park. A disadvantage of building accommodation for University students near Stoke Park is that students would have to travel through the town centre and out again to reach the Stag Hill campus. It’s over a mile’s walk away from the main student campus, and more than 2 miles away from the Manor Park campus and Vet School, which will encourage University students to bring their cars and park around the neighbouring residential streets (not to mention clog up the roads). The local residents association has objected to the application on the grounds that, at 7 storeys, the building is too tall – currently the tallest classroom block is 5 storeys high. This entry was posted in Uncategorized on April 10, 2017 by tejstevens. Hogs Back – why is it worth saving?